The German Breweriana Collectors Society (FvB) has been established in 1966. The German name “Förderergemeinschaft” means companionship of promoters, who are made up of collectors, breweries and other institutions. 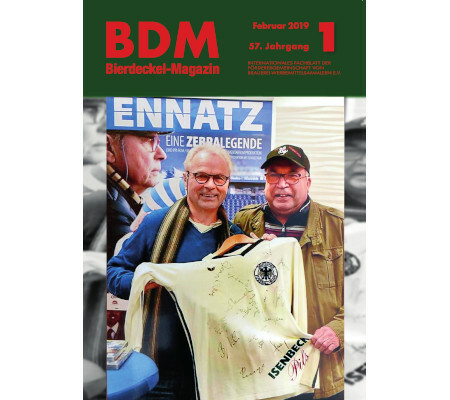 In that year the new registered association adopted the “Bierdeckel-Magazin (BDM)”, which was founded in 1963 as legally independent, as the new club’s gazette. The society’s purpose is to promote collecting of all kind of breweriana („Brauerei-Werbemittel“) such as beermats/coasters, labels, beer mugs (steins), glasses, playing cards, cans, bottle openers, crown caps, drop catchers, signs etc. FvB answers the intended purpose of its articles of association particularly by organizing exchange meetings, by editing and enhancing our trade journal BDM, by arranging collectors’ contacts, by providing new issues, by sponsoring needy collectors and by maintaining, supporting and compiling brewery directories from all over the world. The society is unselfish not pursuing any business and is predominantly a non profit organisation. More than 1000 members from more than 20 countries are affiliated to foster their common hobby. Please remember always, that in this registered association collectors volunteer their time and money to exemplify companionship to you through their own life.